The Doc Ignite program exists to reach under-served filmmaking communities across Canada. This year, the Hot Docs Industry team is crossing the country from east to west, from Lunenburg, Nova Scotia to Whitehorse, Yukon Territory. The first Doc Ignite program of 2019 took place at All Access, an annual three-day media production industry forum produced by On Screen Manitoba in Winnipeg. It caters to producers in the region, which includes a Francophone and Indigenous population of filmmakers in Winnipeg and the surrounding area. Industry programmers Olena Decock and Madelaine Russo landed in Winnipeg to teach a filmmaker workshops in French and English on How to Make Your Local Story Global/Faire d’une histoire locale un succès à l’international. 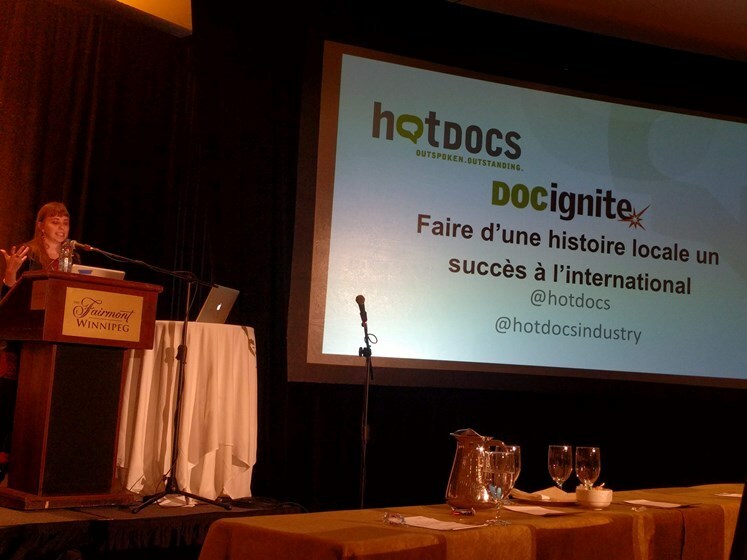 The Hot Docs Industry team knows that, should a filmmaker's aim be the international documentary festival and funding landscape, and it has become imperative to tell their stories in a way that are universal and that have global reach. This doesn't mean moving away from your characters or altering your story. In fact, it means digging deeper into your film and to better understand the universal aspects of your character and your story. Documentary characters are people, and they are more complex than any "character" type you can attribute to them. Looking at your own film, can you identify the multitude of complex emotions, journeys and motivations of your characters? We then must consider these pillars at all stages of a film. How does understand the core of your characters inform the writing, shooting, editing, and marketing of your film, to make it accessible as a piece of art, and marketable as a film that you wish to have reach the widest possible audience. Doc Ignite also breaks down how different story telling elements, such as story structure and exposition, can help make your story feel more universal and help your film travel. As well as the importance of high production value and having the right team on board. And finally, we discussed the challenges of the Canadian landscape: the Canadian broadcast requirements that can narrow the format and style of creative documentaries, as well as the global bias towards, and romanticizing of, American stories.